I have had this old dresser for several years--bought it as a garage sale. It has been hanging out in manland in the basement, holding video games and apparently, dirty dishes. I decided it would be much happier in someone else's home, where it would be loved rather than ignored and abused. The lovely crackle finish on it just can't be duplicated. I gave it a light sanding--there were cream, dark green and a peachy tan paint layers--and then added a coat of turquoise, sanded that and added stain to bring out all of those beautiful crackles. Excuse all of the pictures of this baby, she just is too beautiful to not show all of them. I did add a mirror as the original piece did have one, based on the ledge on the back of the top. I also added the glass knobs because I only had half of the original wood ones. This darling is an oldie--made with square nails. Now she awaits a new owner...sigh. 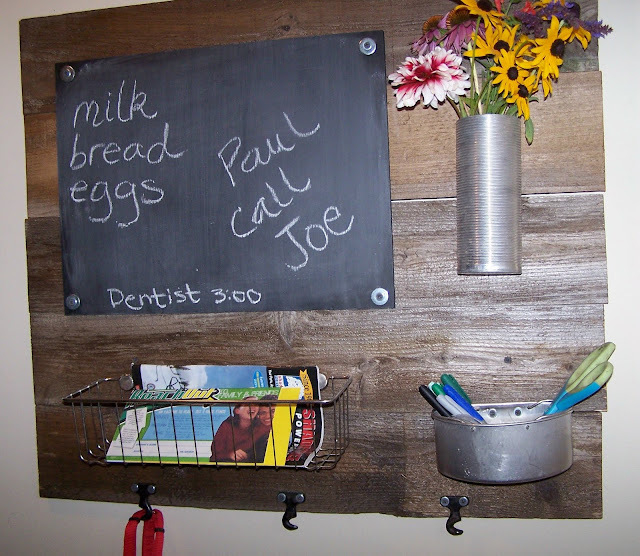 This one was made from old fence boards, a freezer basket, the outside of a thermos, and a small metal bucket. 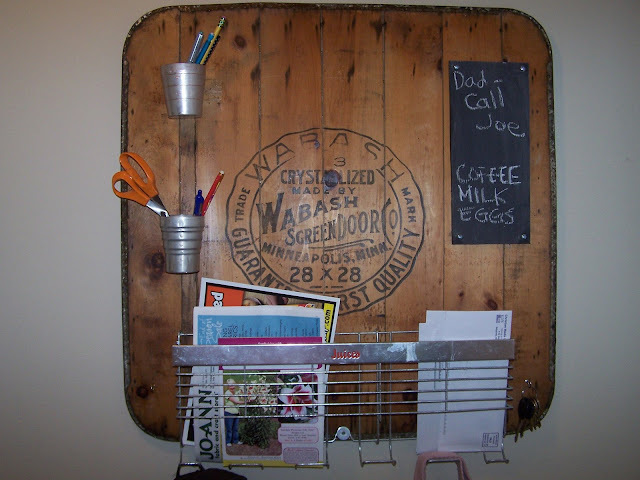 This one was made from an old screen door with a sewing machine drawer for mail and garden fencing to hold magazines and letters. 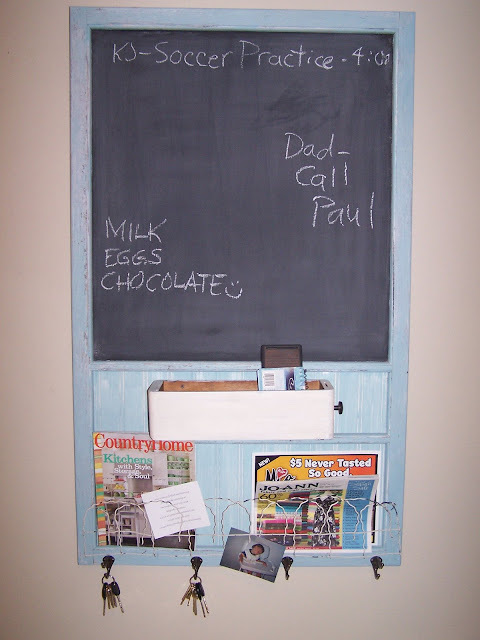 Here is one using an old ironing board with an enamel refrigerator lid for a magnet board and a measuring cup to hold chalk. A locker basket and old hardware drawer were added to this ladder message center. And this one had a freezer juice holder as a mail keeper and coat hooks and collapsible metal cups for pens and pencils. The fun part for me is collecting the various items to use on these message boards. What will hold mail, notes, keys, etc.? 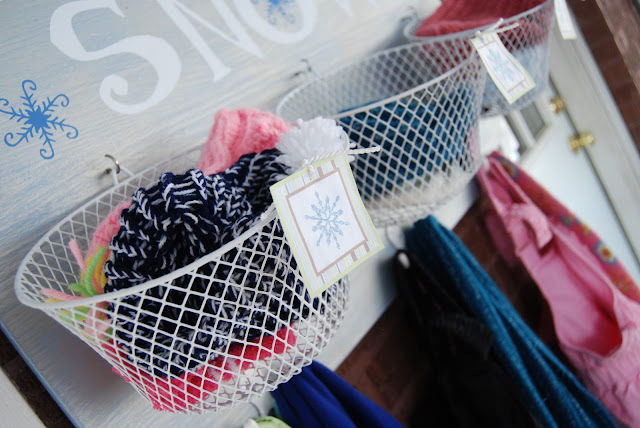 Here is your challenge--create a message board using items in a different way than originally intended. Collect and gather--look for something for a magnet board, something for hooks, something to hold mail and pens or scissors. What will you attach all these to or what will be your backboard? Get funky, think outside the box, create, and most importantly, have fun! If you do this challenge, please let me know--I'd love to show it off! I made my own version of it, quite different from the original, but inspired nonetheless. I used plywood (sand well to avoid splinters) and 2x4's, some paint colors I love, stain. I had to think a bit about the construction of this, mechanically minded I am not. I am so sorry I do not stop and grab my camera when I am in the process--I just get in the zone. I will try to explain it: I screwed down through the top of each square plywood into the 2x4's, making sure to countersink the screws. I then stacked them and drilled through the 2x4 at an angle on the inside--if you look closely you can see the screws. There is a probably a better way to do this, but this is what worked for me. I added some wheels, some feet would work too, but I liked the industrial look the wheels gave it. *STOP--Before you link up, PLEASE read and see what THIS linky party is about--thanks so much!! 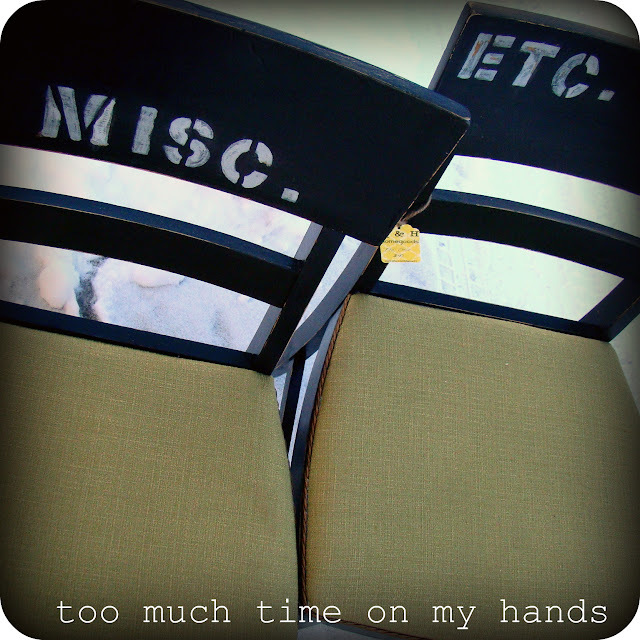 I have been good about following my blogging resolution to prepare posts ahead of time...except today. I did not get my motivated Monday post ready and do not have the time to do so :(. 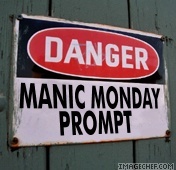 But, I am going to still post the motivated Monday linky for you to share if you have done one of the challenges. The first challenge posted HERE is about using a common item in a new way or the second challenge posted HERE--using a magazine to springboard a new idea! 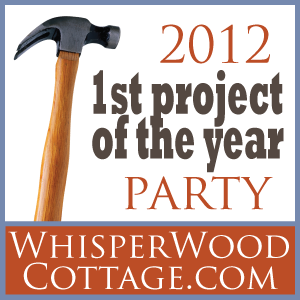 REMEMBER, this is NOT my Under $100 Linky Party--that goes up on Wednesday nights--THANKS! I have had this, what I presume large cupboard door for quite a few years. I picked it up off a pile of roadside trash and it has been living its life as a place to store things on top of in the garage rafters. I pulled her down and did a preliminary sanding. I was overjoyed to find orange and turquoise/old time green underneath. I built a base from 2x4's, and a lot of sanding later (the top coat must have been good enamel), some stain and I had a great sofa/entry/buffet table. The lines or striations are from the wood (?) grain, I like them :). If I had been making this for me, the legs would be orange or turquoise, but this one is for sale and I think the stained legs with the fun top will sell better. Ah, sitting here, under a blanket, drinking a caramel latte (no doubt 5000 calories! ), watching it bluster out--I love blogging! For those of you who aren't, or perhaps are regular readers of my blog, I have started a new feature on Mondays to motivate you to do something different, get you out of your comfort zone. I will often have linky parties on Mondays for you to show off what you did if you take on the challenge or assignment I give you. 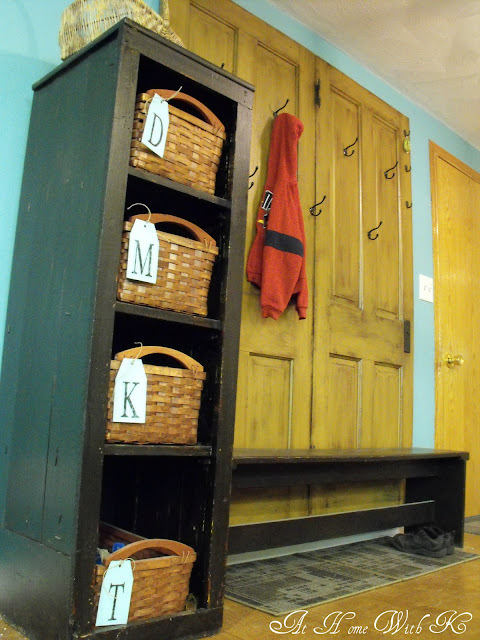 At Home With K has been working on a mudroom makeover, like those doors! This balsamic pork sandwich from Changing My Destiny makes my mouth water. 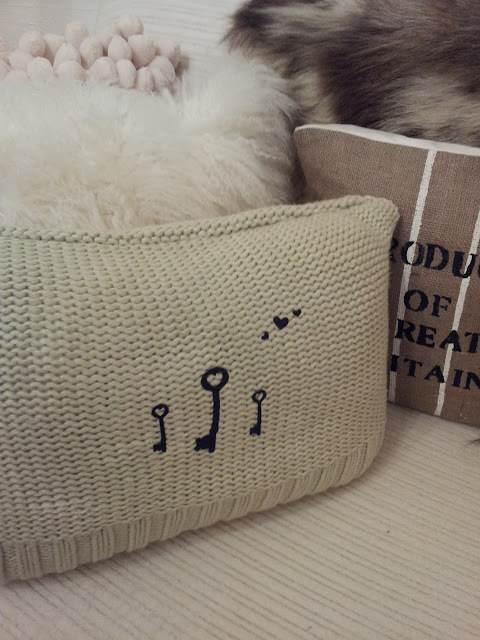 Twiggy Studio shared a sweet Valentine pillow. 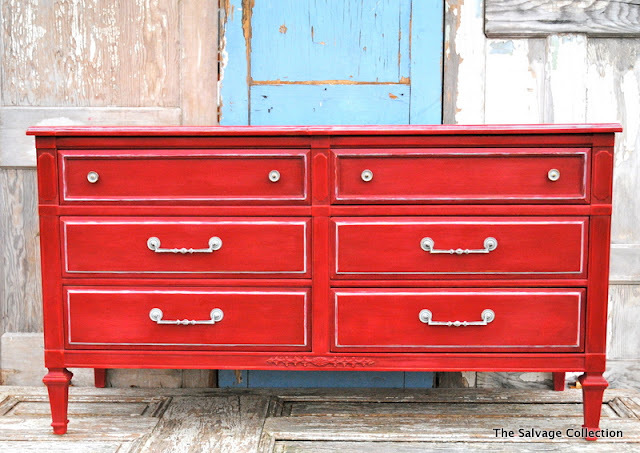 I have tried to get over red, but how can you with pieces like this from The Salvage Collection. Fab Rehab Creations made a cozy daybed. 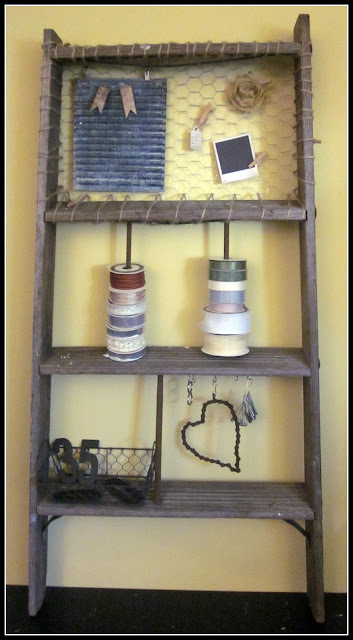 I love a good ladder as you know, Homeroad made a fantastic craft organizer with one. Meg and Mum's roadside rescue turned out beautifully.